Slim Down, Look Great, Be Healthy—The Full Plate Diet (TM) is based on eating foods our Moms said we should eat— fruits, vegetables, whole grains, beans & peas, and nuts & seeds. You can eat meat—just follow Mom’s advice. No yo-yo—you can stay on this diet because you won’t feel deprived—won’t have to eat tiny portions. You get started by making small changes, not big ones. No hassle—you don’t have to count calories, you can shop at your regular grocery store, and spend less on food. Big health payoffs include heart health, cancer fighting, diabetes friendly, more energy and long life. Lots of medical research backing The Full Plate Diet (TM). 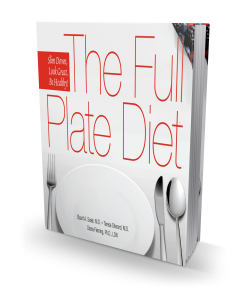 Stuart A. Seale, M.D., board-certified family physician and co-author of The Full Plate Diet and The 30-Day Diabetes Miracle, has helped thousands of patients over the past 30 years. While managing a thriving solo family practice in Springfield, Missouri, for 21 years, he treated an increasing number of patients who suffered from lifestyle-related diseases. Dr. Seale now educates and motivates patients into improved health by treating the underlying origin of their diseases – unhealthy lifestyle behaviors. He has expertise in nutrition, exercise physiology, and chronic disease prevention and reversal via behavior modification. Teresa Sherard, M.D., earned her medical degree from Loma Linda University School of Medicine in 1999. She completed her internship and residency at Loma Linda University Hospital in 2002. Two years later she completed a fellowship in lifestyle medicine at the Lifestyle Center of America. As a staff physician at the Lifestyle Center of America, Dr. Sherard educated her patients to recapture their health and to successfully achieve weight loss. This is accomplished when nutrition, exercise, and behavior treatments are used together. Her warm personality enables Dr. Sherard to build great friendships with her patients. Dr. Sherard’s interest in lifestyle medicine began as she worked as a volunteer at the Wildwood Lifestyle Center and Hospital located in Wildwood, Georgia, near her hometown of Chattanooga, Tennessee. Diana Fleming, Ph.D., L.D.N, was cofounder and comanager of Country Life Vegetarian Restaurants in New York City and London and a cooking consultant for Harvard University and Wellesley College. 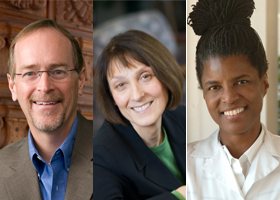 She earned her Ph.D. in nutrition at Tufts University in Boston. All four of her thesis papers were published in the American Journal of Clinical Nutrition. Diana coauthored The 30-Day Diabetes Miracle Cookbook, where her knowledge and expertise were valuable in developing tasty, high-fiber, plant-based recipes that help readers achieve significant diabetes relief and weight loss. She joined the staff at the Lifestyle Center of America in 2002, serving as Director of Nutritional Services since 2003, where her knowledge has been invaluable and her enthusiasm for down-to-earth nutrition education is infectious.